The province of El Oued in southeastern Algeria was rocked by violent clashes between disenchanted youth demanding jobs and better living conditions and Algerian security forces. The clashes take place in a climate of uncertainty in Algeria where the government failed to use the oil mantra to develop the long-neglected south. The protesters in the city of El Maghair also demanded peacefully highways and proper roads before security agents used force leading to clashes. Videos shared on social media showed torched vehicles and blocked roads as well as scenes of destruction of private property. the protests add to a series of dissent in Algeria’s boiling south where the government has been exploiting gas and oil while investing heavily in the comparatively well-off and densely populated north. Algeria’s south is plagued by instability. Most western countries advise their citizens against travel to the Algerian Sahara, the region being fraught with risks of kidnapping by terrorist groups. The population of oil and gas rich south have also protested at the government’s plundering of their resources. 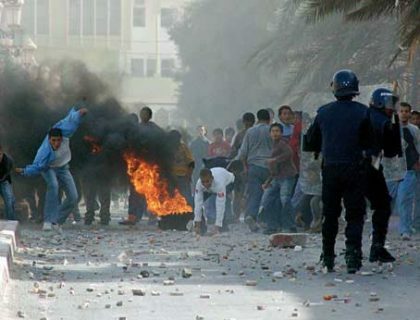 Ain Salah and Ouargla have been the theatre of violent clashes with security forces. The region of Ghardaia was rocked by violent sectarian fights between Amazigh Ibadites and Arab Malikites. Regime opacity and the secrecy shrouding the successor to Bouteflika have also been hampering Algeria from carrying out economic reforms to wean their economy from dependence on hydrocarbons. Actually, uncertainty over Bouteflika’s succession adds to Algeria’s explosive mix: ailing economy, dwindling oil revenues, widespread corruption, fragile social cohesion and lingering terrorist threat, which make the country a powder keg waiting to explode.